When Should A Woman Get Her First Mammogram? All women should engage in shared decision-making with their physicians to decide when to start and how often to screen. All women should have the opportunity to start screening mammography at age 40. For women ages 45-55, annual screening mammograms is recommended. For women ages 55 and over, we support both the transition from an annual to a biennial interval if this aligns more with patient's values and preferences, or continuation with annual screening. All women should discuss with their physician when to stop screening mammograms, such as after age 75. Some organizations recommend every 2 year mammograms for average risk women between the ages of 50 and 75 for the most benefit and the least harm. Women with symptoms, regardless of age should see their physician for an examination and diagnostic mammograms. Women at high risk based on personal history, BRCA gene and/or chest radiation need more frequent evaluation. Women with symptoms need DIAGNOSTIC mammograms as opposed to the 2 view standard screening mammography. When planning for a screening mammogram you usually need to obtain an order from your physician or healthcare provider. However, at some locations at the Cleveland Clinic women can walk in after 3 pm for a mammogram even without a physician order! Usually, you have to wait at least one year from your previous mammogram. Also, plan on making the appointment after you come back from a vacation or a special event, so that you can enjoy your time away and not fret about possibly being called back for ‘extra views’ as so many women have to go through. A screening mammogram is two views of each breast. Many times the breast radiologist needs more views like spot compressions or breast ultrasound to get a more complete picture of your breast and this is why many women get the dreaded ‘call back'. Most of these call back scans turn out to be normal. In the U.S., approximately 10-15% of screening mammograms require additional evaluation of which 90% are benign. If you are menstruating, be sure to schedule your mammogram AFTER your menses as your breasts are less tender. Does Wearing Deodorant Interfere With the Mammogram? Deodorant can interfere with getting the best pictures of the breast, so it's important to avoid wearing deodorant the day of your mammogram. If you do wear deodorant, most offices have wipes or a washcloth to wipe off the deodorant. Being diagnosed with breast cancer is one of a woman’s biggest fears. It is quite common to get called back for 'more views' after a breast screening. For most call backs, the breast radiologists just need a closer look to give women the most accurate assessment of all the breast tissue. Mammograms are not perfect. They do not detect all cancer and they detect many abnormalities that luckily, turn out to NOT be cancer. However, currently they remain the 'gold standard' for diagnosing asymptomatic breast cancer. Do Mammograms Lead to Over-Diagnosis? In general, the concept of 'early detection' is thought to improve longevity and reduce death rates from breast cancer. Though, there has been some research suggesting that physicians overdiagnose some cancers that would not actually progress into cancer. Rates of over-diagnosis range from 1-50%, but most range from 1-10%. Do NOT be surprised if you get the dreaded call back and do not dread an extra check because most of the time, the extra views turn out to be normal. Even if a biopsy is required of the breast again, the results are usually fine and very manageable, even if cancer is detected. And if you have or are diagnosed with breast cancer, rest assured there are excellent treatments and most women continue their active lives without missing a beat. Please continue to get your breast screenings, follow a healthy lifestyle and don’t freak out! Holly L. Thacker, MD, FACP is nationally known for her leadership in women’s health. 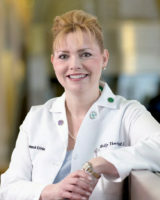 She is the founder of the Cleveland Clinic Specialized Women’s Health Fellowship and is currently the Professor and Director of the Center for Specialized Women’s Health at Cleveland Clinic and Lerner College of Medicine at Case Western Reserve University. Dr. Thacker is also the Executive Director of Speaking of Women’s Health and the author of The Cleveland Clinic Guide to Menopause. Her special interests and areas of research including menopause and related medical problems including osteoporosis, hormone therapy, breast cancer risk assessment, menstrual disorders, female sexual dysfunction and interdisciplinary women’s health. Are Breast Cancers Being Over-Diagnosed? Do YOU Need a Mammogram? What if They See Something on My Mammogram? Ask the Expert: How can I Minimize my Risk of Breast Cancer?